[Note: This DVD also includes the new closed captioned, classroom version of KING CORN (50 mins). Following up on their Peabody Award-winning documentary KING CORN, Ian Cheney and Curt Ellis have returned to Iowa with a new mission: to investigate the environmental impact their acre of corn has had on the people and places downstream. 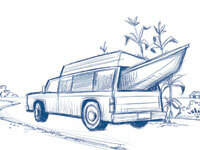 In a journey that spans from the heartland to the Gulf of Mexico, Ian and Curt trade their combine for a canoe, and set out to see the big world their little acre of corn has touched. On their trip, flashbacks to the pesticides they sprayed, the fertilizers they injected, and the soil they plowed now lead to new questions, explored by new experts in new places. Half of Iowa's topsoil, they learn, has been washed out to sea. Fertilizer runoff has spawned a hypoxic 'dead zone' in the Gulf. And back at their acre, the herbicides they used are blamed for a cancer cluster that reaches all too close to home. A lively investigation and a worthy follow-up, BIG RIVER grows to ask is industrial agriculture worth its hidden costs? "A sharp and clever reminder that nothing ever really goes away, certainly not the soup of chemicals we're pouring on our fields." "In Walden, Henry David Thoreau defines the `true cost of a thing' as `the amount of life exchanged for it, immediately or in the long run.' With characteristically understated eloquence, Ian Cheney and Curt Ellis illuminate the devastating downstream consequences of growing corn, the central commodity of the American food system. After witnessing these health and environmental effects, viewers may well conclude that the `true costs' are too much for us or our children to bear." "Big River tells 'the rest of the story.' King Corn helped us to understand how growing corn in Iowa is not particularly profitable for farmers. Big River takes us down stream from the farm to better understand additional unintended consequences--of growing as much corn as possible as--especially to the quality of our water. I appreciated the fact that Big River does not blame the farmer for this ecological disaster. As Paul Thompson has indicated, farmers are now forced into a system which requires them to 'produce as much as possible, regardless of the cost' and Big River points out some of the costs to the farmer, to the environment, and to our communities...We have all been living as if nature's sinks were limitless and they are now full, so we have to redesign our human economies, including agriculture, to function within the limits of nature's resources and nature's absorption capacity. Anything short of that will only degrade our big rivers even more--to the detrimentof the health of all living species--including our own. Big River begins to help us understand that." "[Big River] raises profound questions about the current petroleum-based agriculture on which Americans rely for most of their food. With rising petroleum prices, widespread environmental problems, and climate change we will need to rethink the very foundations of modern agriculture. It is simply too important to be left to the experts. This film provides a good starting point for public engagement." "King Corn uses an acre of corn in Iowa to explain how our quest for cheap calories diminishes the quality of our food. Big River uses a canoe trip down the Mississippi to explain how millions of acres of Iowa corn diminish the quality of life of those who live downwind and downstream. Together they make a compelling case for radical changes in what we eat and the ways we produce food." "This film is accessible to all audiences and would serve well as a stand-alone film or used in conjunction with King Corn...Demonstrate[s] the dialectic relationships among multiple stakeholders affected by the process and the effects of industrial farming--including those who have no connection with farming. This over-arching theme provides ample opportunity to engage undergraduate students in discussion about a number of fundamental issues in environmental sociology, social psychology, social inequalities, and introductory courses in sociology touching on any of these areas." "Big River provides a concise overview of the environmental and economic factors at work in American agriculture and a compelling look at the long term consequences of maintaining the status quo. King Corn and Big River complement each other, with King Corn providing the historical and political context for current agricultural practices and Big River showing the personal and societal costs of these agricultural practices." "A provocative film that begs extended discussions of global capital, power, labor, commodity fetishism and governmentality. After all, as the last farmer interviewed reminds us, 'if you are not aware of everything that stands behind all that agriculture, you can live with the illusion that there's nothing wrong.' Suitable for college courses in cultural anthropology, anthropology of food, environmental anthropology, and economic anthropology, as well as general audiences." "Viewers are asked to consider the long-range consequences of using chemicals and the resulting loss of human and animal life...Science and current events classes can utilize this program, and it should be added to all environmental collections."